Singapore Advanced Biologics is pleased to announce the opening of its laboratories at NTU Innovation Centre. To mark the occasion, we wish to cordially invite you and your colleagues to RNA Interference Scientific Session. Registration and Networking. Food and refreshments will be served. To attend, please register by filling your information in the form on the right. Contact us at info@sabio.com.sg or +65 6423 0985 with any questions. We are looking forward to seeing you at the event! 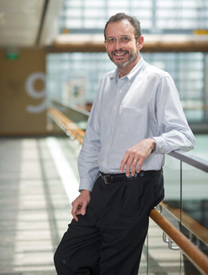 Mariano A. Garcia-Blanco M.D., Ph.D., is Charles D. Watts Professor of Molecular Genetics and Microbiology, Professor of Medicine, Director of the Center for RNA Biology at Duke University, and Professor of Emerging Infectious Diseases at the Duke-NUS Graduate Medical School, Singapore. He has made important discoveries in alternative RNA splicing and disease, host factors for pathogenic RNA viruses providing needed targets for anti-viral therapy, and pioneered the imaging of splicing in tissues and tumours of living animals. Professor Garcia-Blanco obtained his AB in Biochemical Sciences at Harvard College, and his M.D. and Ph.D. (in Molecular Biophysics and Biochemistry) at Yale University. He received postdoctoral training in RNA biology with Nobel laureate Phillip A. Sharp at MIT. Prof. Garcia-Blanco is a Fellow of the Association of American Physicians and an elected Fellow of the American Association for the Advancement of Science (AAAS).